Secluded on 205 acres of scenic countryside, less than an hour from Washington D.C., and eight miles from Washington Dulles International Airport, Lansdowne offers guests exceptional ease of access, with door-to-door travel times of less than two hours from most major East Coast cities. 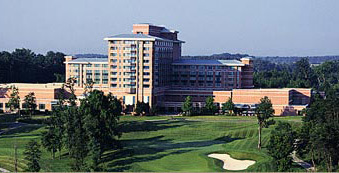 Lansdowne features a state-of-the-art conference center, a golf course designed by Robert Trent Jones, and many other recreational facilities. It is located along the Potomac near Goose Creek. Adjacent property is owned by Xerox Corporation and used for a training center.